Peter Rabbit discovers a surprise visitor to the Smiling Pool. It’s Mrs. Quack the Duck. She and Mr. Quack have been hunted as they attempt to migrate. Mr. Quack is missing and Mrs. Quack does not know his fate. Peter Rabbit, Jerry Muskrat, Sammy Jay and Blacky the Crow decide to help Mrs. Quack by searching for Mr. Quack. Young children learn the problems confronting migrating animals and their struggles to survive. 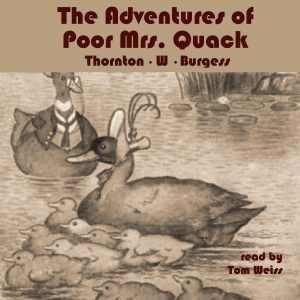 As with all Thornton W. Burgess stories, good values and positive attributes are part of the story.